This book tells Frieda's story of immigrating to America in 1928. Retelling will help you weave together your story on the pages of template-style books, incorporating photographs and documents. 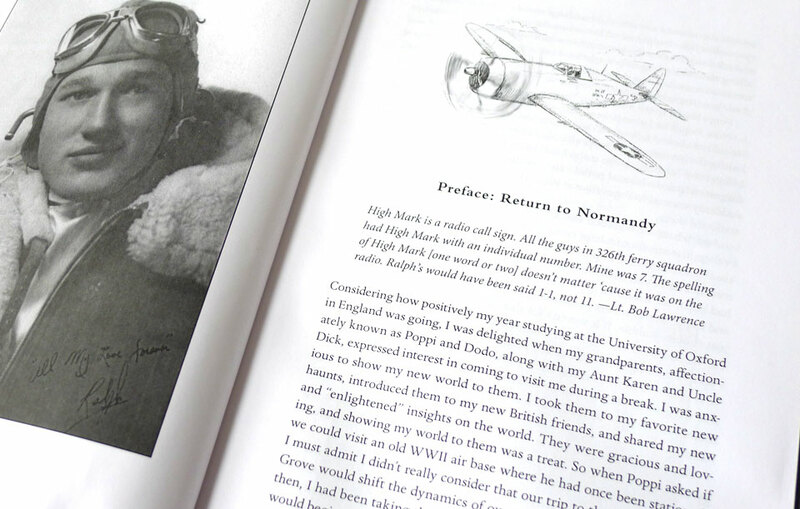 These template-based books are crafted to tell one poignant life story in depth with photos or documents to illustrate. Books in this template-based book series tell a story with photos supported by text. This series caters to a collection of treasured possessions, rich with their own stories. Tell your story through treasured things. Retelling will help you weave together your story on the pages of template-style books, incorporating photographs and documents. 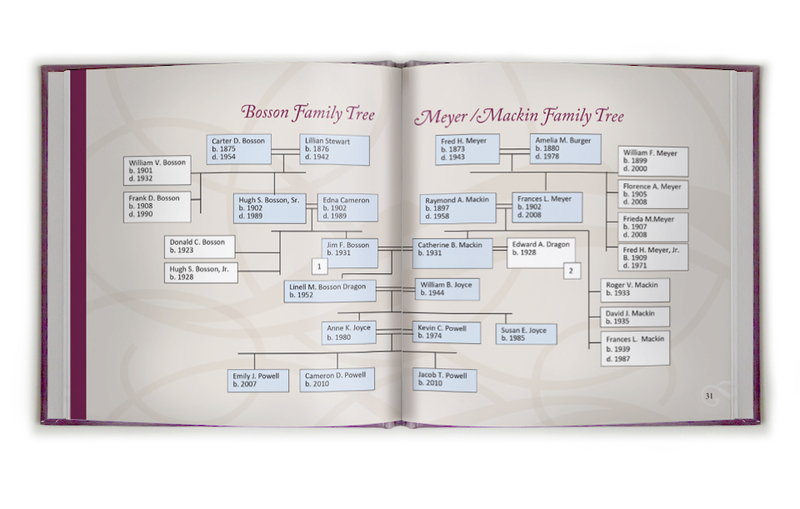 You can include a family tree in your book. Retelling can help you capture your story between the covers of a book or in audio format. Or both. Perserve the voices and stories with an audio format. 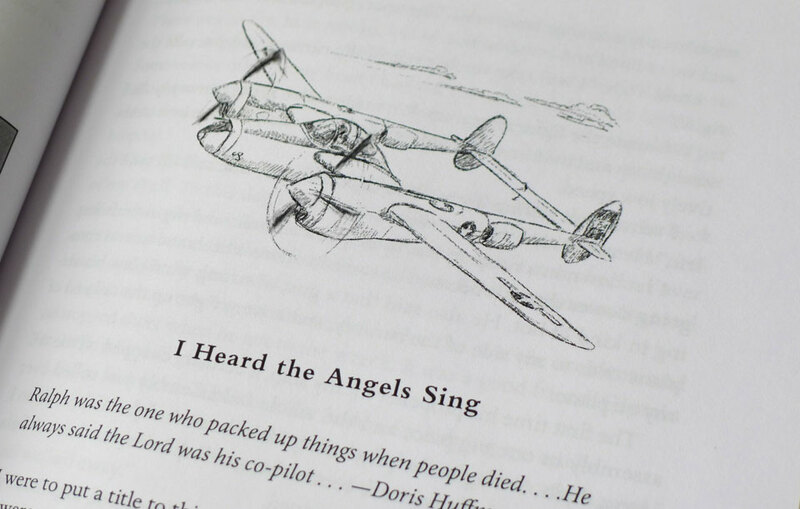 To celebrate Anton "Tony" St. John's 90th birthday, his wife commissioned Retelling to record Tony describing life-shaping episodes: growing up on an Indian reservation in South Dakota, being wounded in WWII in the Pacific, and meeting his wife-to-be, Betty. Linell Joyce chronicled the rich experiences of her family life on assignment with her husband in Austria, Jordan, Ivory Coast, Thailand, Cyprus, and England. Her beautiful book contains more than 200 family snapshots, as well as excerpts from a correspondence with her grandmother that helped combat loneliness and tied Linell to life in the USA. 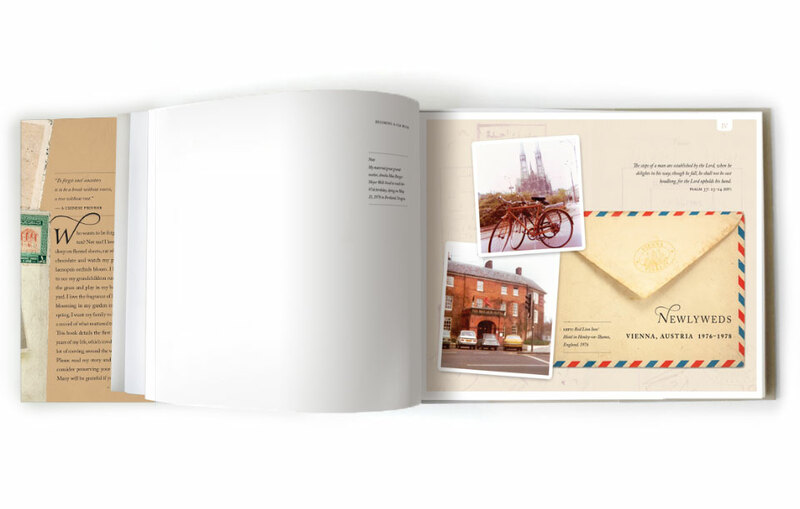 The thoughtful design by Cindy Young for Linell’s 213-page, 8.25" x 10.75" hard cover book uses the theme of international correspondence. The cover design is printed both on the book and on a dust jacket. Some stories are so rich in photographs and elements of design that they lend themselves to a coffee table book, to be kept where family and friends can enjoy it at their leisure. You have a tale that you want to market to the masses. Capture the history of your community to preserve its legacy. Retelling is experienced in pulling together the many strands of a layered history to tell the story of a business or organization. Clients have included a thriving fourth-generation family business, a visionary high school, and a church.